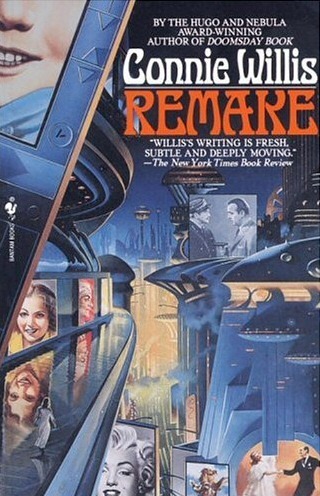 Extrapolating from the current intersection of Hollywood’s aversion to risk and its reliance on computer-generated effects, the future-fiction novel Remake (1995) dramatizes a film industry in which new live-action films are exclusively CGI-generated pastiches of old movies. Want to put yourself in a film and then change the ending? Just visit a video booth at Hollywood and Highland, and you can be the Humphrey Bogart in Casablanca who ditches Claude Raines and strolls into the mist with Ingrid Bergman instead. Such cinema revisionism—by fans and studios alike—is a juicy conceit, which Remake, at a brisk 176 pages, only begins to extract. Tom, the novel’s protagonist, re-edits old films for a living, removing their references to “AS’s”—addictive substances, such as alcohol and cigarettes—a task reminiscent of Steven Spielberg’s gun/walkie-talkie swap in the DVD release of E.T. Rather than recapitulate the plot of Remake, I want to examine a scene in which Tom goes to an industry party and runs into a computer graphics tech named Vincent, who is demonstrating his latest breakthrough: a “weeper simulator” that digitally applies tears to any actor.